Duquesne’s pair of senior guards—Derrick Colter and Micah Mason—saw their collegiate careers come to end as the Dukes were eliminated in the second round of the CBI tournament by Morehead State, 82-72, on Monday Night. Duquesne finished the program’s 100th season with a 17-17 record; officially the first non-losing season under head coach Jim Ferry. Similar to many of the Dukes games’ this season, Colter and Mason led the way in a losing cause. Colter, despite only shooting 4-15 from the field, still finished with 16 points along with four assists and five rebounds. Mason tallied 24 points on 9 of 18 shooting. The home team jumped up to an early 15-7 lead in the opening four minutes as the Eagles capitalized on multiple Duquesne turnovers to generate three 3-pointers. With just under 11 minutes remaining, the Dukes cut the deficit to three once LG Gill grabbed an offensive rebound off of a Mar’Qywell Jackson missed three and, before coming down, dunked the ball. This was part of an 8-0 Duquesne run which eventually gave the Dukes the lead as Morehead State went scoreless for just over three minutes during the stretch. The Eagles responded with a brief 11-4 run to regain the lead as Duquesne missed six of their next seven shot attempts. Mason then made consecutive threes to tie the game at the 4:09 mark. The second three was a tightly defended fade away from the right wing. 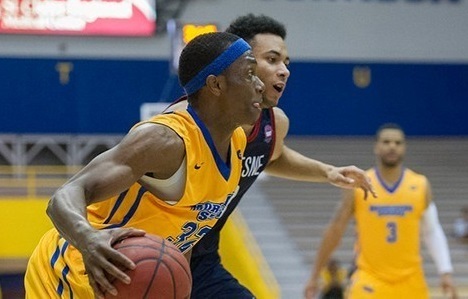 With 1:35 remaining in the first half, Morehead State guard Lamontray Harris, a 44 percent 3-point shooter on the season, drained a three to put the Eagles up four. Then, in the final seconds of the half, Brent Arrington pulled up from half court and buried a three to make the score 43-36. While both teams shot over 40 percent from the floor at halftime, Morehead State went 55 percent from behind the arc. Duquesne accounted for the 3-point disparity by outscoring the Eagles in the paint by 10. Mason and Arrington each reached double figures in the first 20 minutes. Colter and Mason made back-to-back threes in the opening minutes of the second half to reduce the deficit; however, one the other end, the Duquesne could not limit the Eagles 3-point shooting. Within the first five minutes, Duquesne’s size advantage quickly disappeared as Gill, Darius Lewis, and Nakye Sanders all picked up their third personal fouls. Duquesne and Morehead traded baskets over the next six minutes, with the Eagles lead ranging between five and eight points. At the 8:38 mark, Morehead State guard Corban Collins’s easy dribble drive to the basket for a layup made the score 64-55, which matched the Eagles largest lead of the game. The Dukes deficit increased once Arrington stole the ball and passed it up to a sprinting DeJaun Marrero for a hook shot over the sole defender in Mason. Morehead State missed six of their next seven shots, but, at the same time, Duquesne went on a three-minute scoring drought to minimize their comeback chances. Four different Eagles finished in double figures led by Arrington with 17 points and Xavier Moon who knocked down three 3-pointers. Colter will leave Duquesne with 1,695 career points, placing the guard seventh all-time in program history.